Supplied with 5 piece accessory kit. 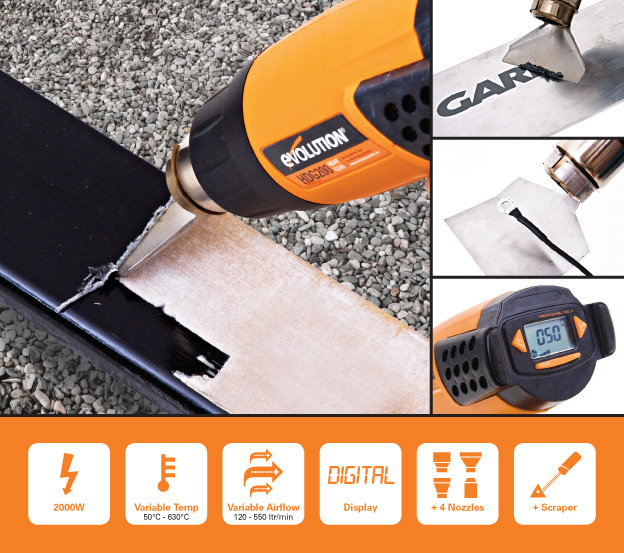 With a powerful 2000W motor and a variable airflow speed of 120 - 550ltr/min, the Evolution Heat Gun is ideal for Stripping Paint & Varnish, Curing Glues & Epoxies, Waxing or Dewaxing, Softening & Forming Plastics, Removing Adhesive Labels & Graphics, Heating Liquids, Applying Heat Shrink & Film, Drying Out Damp Wood, Lifting Tiles & Edging Trim, Drying Paint or Varnish, Lighting Barbecues, Loosening Rusty Screws or Nuts & Removing Caulking. Gives instantaneous heat ideal for Heat Shrink Tubing which is used to insulate wires offering abrasion resistance and environmental protection for stranded and solid wire conductors, connections, joints and terminals in electrical engineering. Perfect for electricians! Other key features include a clear, easy-to-understand digital display and an integral base stand for 'hands free' use. 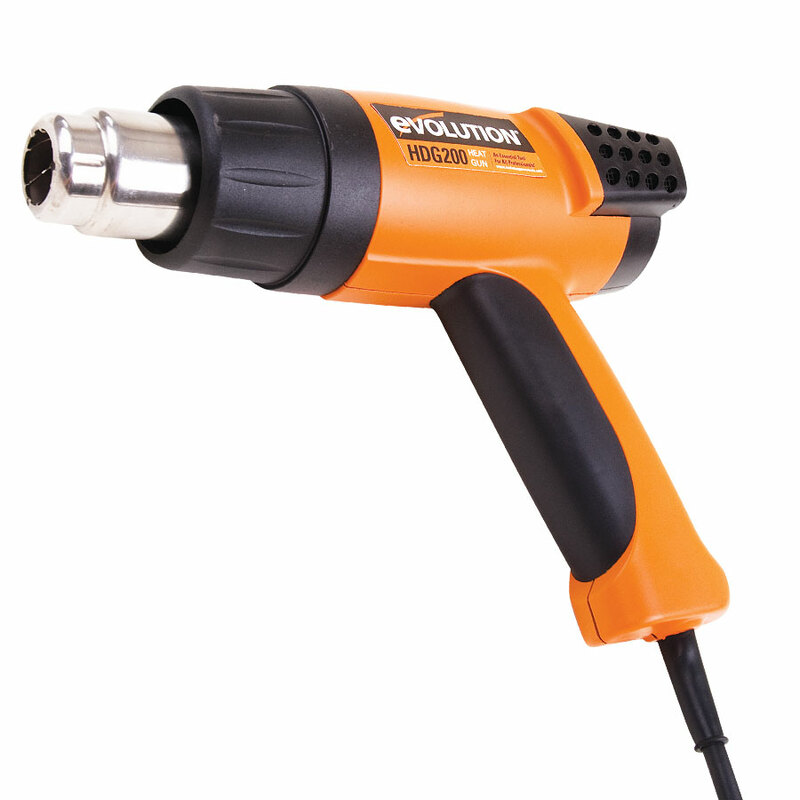 With an incredible temperature range of 50 - 630°C, the Evolution Heat Gun is suited to jobs aplenty. Supplied with a carry case, four nozzles and a scraper - this multipurpose tool will not be found wanting. 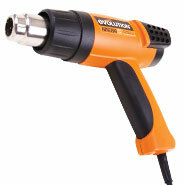 Reducer Nozzle (1) - Ideal when you need to apply heat to a specific area. Glass Protector Nozzle (2) - Perfect for stripping, ensures direct heat is kept off window frames. 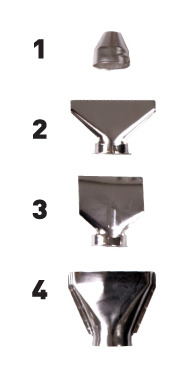 Reflector Nozzle (3) - Wraps around a metal pipe to distribute the heat evenly around the pipe surface. Flat Nozzle (4) - For spreading the hot air over a long area that is wide. An essential tool, for all professionals, which gives instantaneous heat!